The Eucharist is at the center of our life together at St. Gregory's. The Eucharist is for everyone: babies, children, teens, adults, and elders. In the Eucharist we encounter God--in scripture and song, prayer and silence, bread and wine, friends and strangers--to be transformed. We celebrate the Eucharist at St. Gregory's on Sunday mornings at 8:30 and 10:45 AM, and on second Sundays at our 5:00 PM Supper Service. On Sunday mornings beginning at 8:00, we offer a 30 minute contemplative service of prayer, chant, and silent meditation called "Daybreak" preceding our service of Eucharist, which begins at 8:30AM. You can download and listen to audio files of recent sermons from our Sunday Morning Eucharist anytime. Below are resources to help people of all ages understand and participate more fully in our Sunday morning Eucharist. 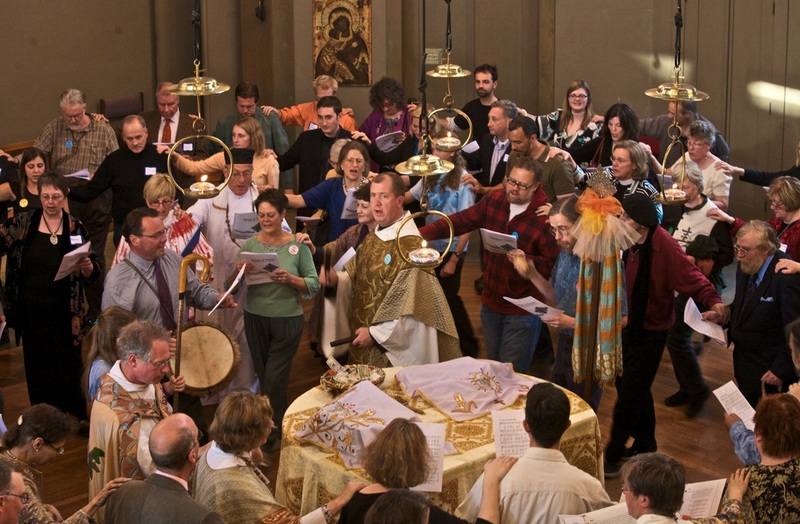 Learn more about the practice of liturgy at St. Gregory's, the core values that shape it, and the art, architecture, and objects that surround it. This book includes reflection questions for everyone, and practical suggestions for including younger children in worship. You can download a free PDF of St. Gregory's Worship Book here, or order a hard copy ($20) of St. Gregory's Worship Book here.